Littlejohn Auctions, a leader in the auction industry since 1977, provides it's customers the most contemporary auction marketing methods available. Visit their award winning website today! This is the second auction needed to empty their Home & Buildings. 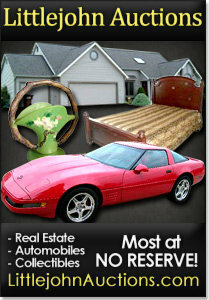 Riding mowers, Many shop tools, garage items, lg tool box, clean household, Very Nice furniture and collectibles. Must take a look. 1993 GMC Sierra Pick up Truck from the estate of Keith Eberly. Overall good condition with 144,000 miles. Taken care of. This is the first of 2 Auctions needed to empty the home contents. Several generations of items collected over the years. Furniture, glassware, collectibles, books, toys and so many more. Treasures. NO RESERVE! 2 BR, 1 Bath, 980 sq ft 14'x70' 1989 Redman Mobile Home located at 1204 Shawna Ave., West Edge Park, Auburn, IN. New owner must be approved by Park Mgmt if they plan to live in park. This is a 1986 Sylvan fiberglass fishing boat with 1994 Mariner 75 horse outboard motor on a 1989 Shorelander Trailer. Good Fishing outfit. 19' x 21' x 8.5' tall in center. Sunsky Carport with extra side panels. To Be Removed by buyer.